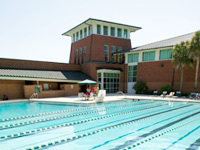 This card provides use of the Hollis Center pool and fitness facilities, use of the library**, including checkout privileges, and discounts for School of Music concerts and Theatre Arts performances. This card does not include access to or discounts for athletic events. You must have a Stetson degree and be in good standing with the University in order to be eligible for the Alumni ID Card. ID fees are $75 annually for a single membership; $140 annually for alumni and children dependents under the age of 18 (up to 4 family members). Additional members are $35 each. ID Cards are available for purchase at the Meadows Alumni House, 217 E. Michigan Ave., DeLand, FL 32723. The first $75 of your ID purchase (the single membership price) can be deducted from your taxes as a charitable contribution. *Alumni ID Cards are purchased at the University's discretion. We reserve the right to deny this privilege. We are pleased to offer all alumni and parents, at no cost, an MMS card offering discounts through a variety of car rental companies and through Choice Hotels International. Call 800-688-HATS to request a card. Is there some way you would like to offer your services to Stetson recent graduates and students? The Office of Career Development works with alumni who would like to get involved. The Office of Career Development also has job search resources available for currently enrolled students and recent graduates searching for employment opportunities. For more information, visit stetson.edu/administration/career/alumni. At Stetson University, we seek to increase knowledge and close skill gaps in our community, allowing professionals to achieve their goals and pursue lives of significance. Professional and Corporate Education was developed to serve both the university and the greater community by fulfilling these needs. Offer comprehensive and modern professional development programs. Develop and teach timely programs for continued employment, promotion and current skills. Read more about the Professional and Corporate Education program. In order to help our alumni find good sources for "Research After Stetson," the library has developed a research guide. 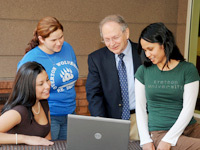 Alumni can stay connected to the university with a free, permanent "stetson.edu" e-mail address. It can be difficult to find a personal e-mail address with the level of professionalism and prestige associated with the Stetson name. Use your account for all those times you want to make a good impression. E-mail forwarding is available. If you move or change jobs, just update your forwarding address in our system. To sign up, apply using the Lifetime Email Request form. Within 10 business days, we'll notify you of your new, permanent email address at the stetson.edu domain. You can obtain an official copy of your transcript from the Office of the Registrar at Stetson University. Because of federal rights to privacy regulations, it is absolutely necessary to order transcripts in writing (telephone requests cannot be honored). For more information on obtaining a transcript, please visit the Office of the Registrar's website.